Water meal treatment is now available for the pond. 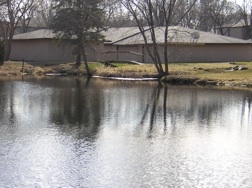 MidWest Aqua Care will flag the pond area when treated, although the treatment is for water only and no any surrounding grass areas. Let’s hope this improves the appearance of the pond. Please turn on outside water if you have the access and have not done so already. This will be a very busy project season for West Unity. We will be repairing exteriors of units and garages, painting, replacing all soffit areas with fully vented soffits, wrapping fascia, repairing gutters, insulating attics, and adding roof vents. All patios must be cleared of items so contractors have clear access. If the contractors have to move items to gain access you will be charged their hourly rate to do so. Fences will be painted so it is recommended that any annual planting beds not be close to the fences. Notification and specific instructions will be given to you as each project is scheduled.